This is not really DIY instruction, but rather some pictures that might help you to remove the gauge. If you wanted to paint the gauge ring... or this Make sure disconnect the battery and pull the steering wheel all the way out before you do this. So the first step is to remove the panel below (I marked it dark red). I heard you can just pull this out easily for 997 or Cayman, but mine(987) refused to come out. Here are some pictures that show how it fit into the dash. The bottom half is folded Close up (bottom center of the picture above) Close up (right side) You will 2 screws after this piece is out of the way. Just remove them and take the gauge out. 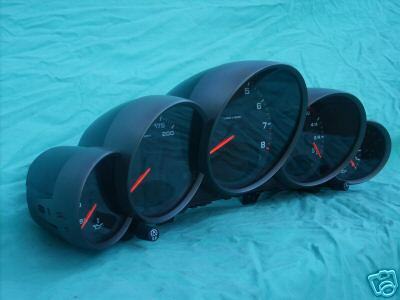 There is a 997 cluster on ebay. Listed for $179 with a buy it now price of $219. You should do it. This is something i've always pondered when jumping into the drivers seat. Is it really as simple as R&R the guages and expect the ECU to operate the extra dials? No clue how to swap a 997 cluster into a 987. But someone will do it sooner or later. I hope so too, but if you haven't come across it then i think its safe to say its early days yet. Mind you, i'm a little doubtful if there is actually much space either side, unless those 987 dash side trims (either side of the stock guages) are removed prior to fitting. I just bought 986 aluminum guage rings, they don't fit 987.
need more help....i got as far as removing the 2 screws like you mentioned, but my guage cluster and surround refused to come out no matter how i pryed. could you give me more information as to removing the actually guage cluster? Did anyone ever try the 997 cluster in the 987? Most curious as the lack of instrumentation has always bothered me on the 987! Its tough. Pull it straight towards you. Keep wiggling. You have to have a good grip and pretty strong hands but it does come off. Have steering wheel all the way out and down as far as it will go. Grab that sucker and pull just above the vinyl. Actually, the first plastic piece is a bit tricky. It has longer plastic lugs at the top (L&R) which insert down into the dash, and shorter ones at the bottom which go up, so just pulling can just make it hold on tighter. Use something to pull it downwards at the left and right sides until the lugs are clear, then pull outwards. Then push the whole thing directly up which disengages the top lugs, then slide it forwards to remove it as there are 2 longer plastic 'sliders' at the top in the centre. Hope this helps. Has anybody tried changing the bulbs behind the dials to LED version, so they are brighter. If so, how did it go and what parts did you order.